The annual FFA Week was a resounding success for the club. 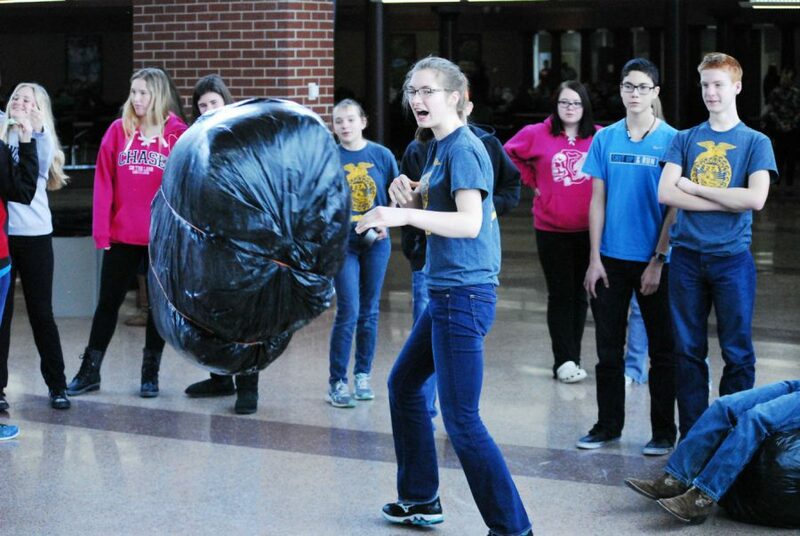 Students participate in lunch games during FFA week. The highly anticipated annual FFA week was from February 17-24. During this week, FFA members share with local, state, and national audiences what FFA is and the impact it has on members everyday. The week started off with glitter vs camo, followed by chevy vs dodge, and ended with the FFA colors; gold and blue. Members of the club were satisfied with how the week turned out including advisor Mr. Pliscott. Every year the members plan dress up days for the week, and this year was notable in numerous ways. Many students enjoyed the lunch games that were provided such as bean bag toss, tire rolling, cow lassowing, and more. Haley Helgren along with Lindsey Miest and others hung posters around the school getting everyone in the FFA spirit. Helgren mentioned that, “it went really good and a lot more people got more involved. I know some of the teachers said this year was better than the last 2 years, we didn’t do anything. A lot of people played the games and it got pretty chaotic.” Their hard planning made up for previous years, and it certainly got students involved even more. The success doesn’t end there. At the end of the week, the Farmers Share Breakfast had 300 + people show up Saturday Morning. They savored delicious pancakes as well as hash browns, bacon, juice, and milk. The morning was such a hit that they ended up running out of food. Hopefully next year will bring FFA members more success and more students will be encouraged to join in the FFA fun.